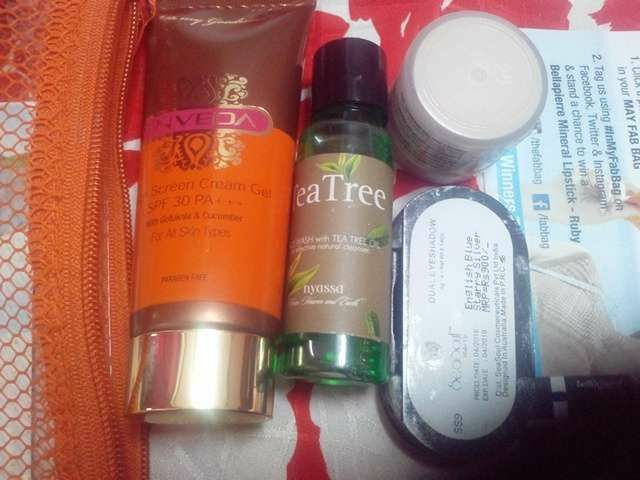 This May Fab Bag is different from rest of the Fab Bags, I have been receiving till now. This is a beautiful transparent summer bag with a net cross design in a cool orange shade. This is the first time the bag is designed in a net pattern and I am quite loving it. Lets take a look at the products of this Fab Bag May 2016. 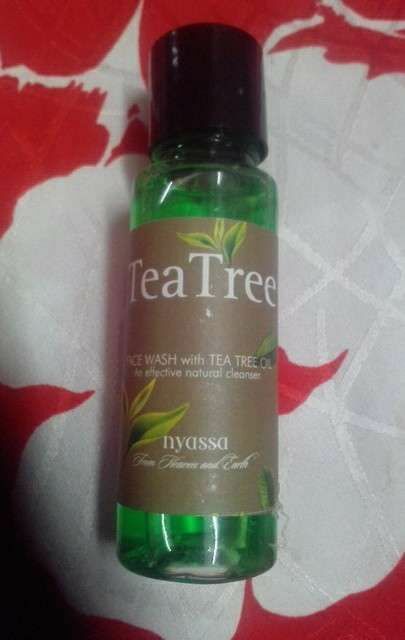 Nyassa Tea Tree Face Wash – Rs 300/- for 145 ml. 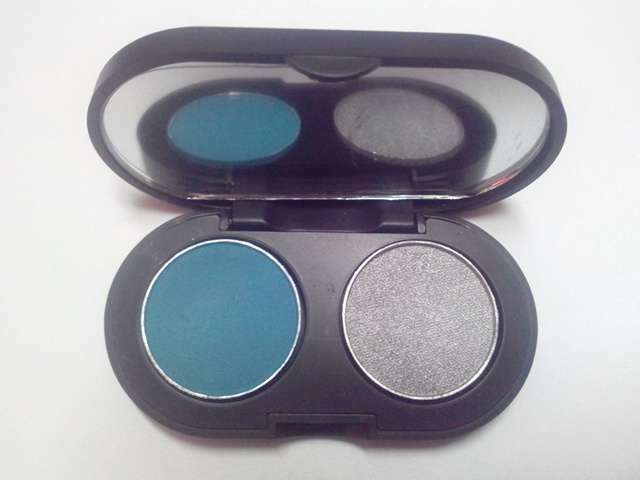 Seasoul Dual Eyeshadow Palette – Rs 900/- for full size. Inveda Sunscreen Cream Gel SPF 30 – Rs 225/- for 75 ml. The Nature’s Co White Tea Night Cream – R 895/- for 50 ml. This transparent fab bag of this summer month contains a sunscreen from Inveda. I am happy to get this sunscreen this time, since we simply cannot step out these months without sun protection. I have used Inveda BB Cream before and liked it over all other BB Creams and quite excited to try this non sweaty sunscreen with SPF 30. 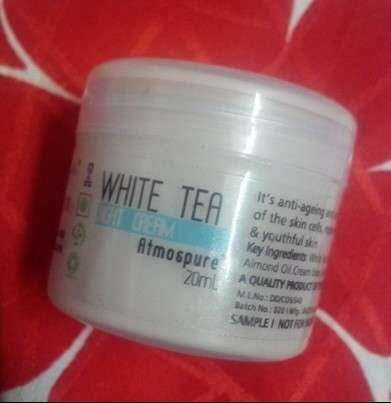 The best part is its suitable for all skin types including the oily skin like mine. Its very difficult to find the right sunscreen for oily skin because most of them tend to be greasy and nothing can be worst than a greasy thick sunscreen on oily skin in summers. But this one seems to be light and matte as per the claims and is already in my trial shelf for tomorrow, to deal with these sweaty summers. I think this Tea Tree Face Wash was specially sent keeping this summer month in consideration. There is so much oil production these months resulting into acne pimples and zits on skin. Tea Tree oil works wonderfully in controlling all these skin problems and this comes a great cleanser for these summer months. Though people with dry skin would want to skip this, since this might end up leaving their look even more drier and thus they should consider trying some other facial cleansers for dry skin. Last but not the least comes this Nature’s Co White Tea Night Cream. I am not very much fond of using night creams in summer months because most of them leave the skin greasy and I simply avoid the slightest of greasy stuff these summer months, but I am quite sure this one would be different in this case since Fab Bag Team always takes care of the season while sending the products. This was all about this month’s Fab Bag May 2016 and its products. I hope you liked the review. Would soon be updating the individual reviews, till then check out other summer posts. 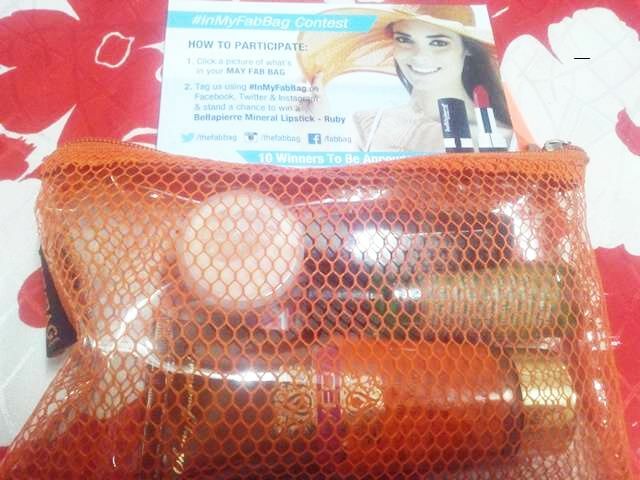 For those who are new to Fab Bag, its a monthly makeup beauty products stuffed bag which comes as a surprise every month with tons of offers and contests. If you haven’t already subscribed to it, then go ahead and do it right away. Fab Bag May 2016 Review. Labels: FAB BAG, Fab Bag May 2016 Review. The tea tree face wash looks interesting. Can't wait for my Fab Bag to arrive. The products look amazing.